Nestled in the foothills of the Green Mountains and close to all the amenities,this townhome has beautiful country setting. The main level has a full kitchen,half bath, dining and living area with fireplace and a deck. 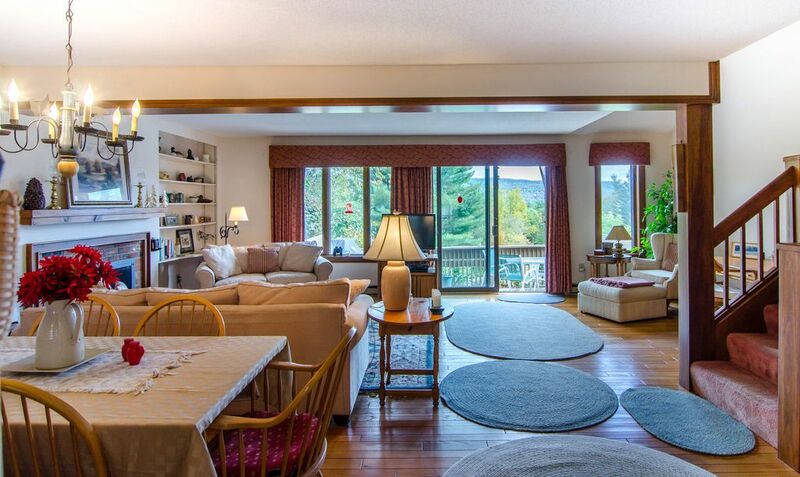 There are scenic views of the rolling foothills of the Green Mountains from the deck and living area. The upper level consists of three bedrooms and two full baths. The first bedroom is a queen sized master bedroom with adjoining master bathroom ensuite. The second bedroom with a queen, and the third bedroom with two twin beds share the second full bath on this level. The Village of Quechee is within easy walking distance and all the Quechee Lakes and area amenities are just a few minutes drive. Whatever time of year you decide to visit Vermont, you will enjoy Quechee's spectacular views, convenience to recreational activities, and a comfortable feeling of luxury and seclusion. While offering the best of Vermont vacations, Quechee is convenient to Boston, New York and Albany, cultural and entertainment events and nearby world class health care (Dartmouth Hitchcock Medical Center). The Quechee Club boasts two championship golf courses (Highland and Lakeland), which in the winter are groomed for Nordic cross country Skiing trails. In addition, Quechee offers tennis, paddle tennis, skiing and an array of options for swimmers, hikers and fisherman. The Club House has multiple dining options as well as a state of the art fitness facility and indoor and outdoor pools. Optional packages to access of the Quechee Club's amenities are available upon request. Quechee is centrally located between the beautiful towns of Woodstock, Vermont and Hanover, New Hampshire, the home of Dartmouth College. Hanover and Woodstock combine the quaintness of beautiful New England villages with the cultural sophistication of a college town. Galleries, unique shops, museums as well as a variety of excellent and unique dining experiences are available in both towns. Killington is approximately 30 minutes from Quechee and offers world class skiing, mountain biking and other year round activities. Quiet, clean and a good choice for a Dartmouth event, or a fall leaf-peeping week-end. We stayed at the property for a Dartmouth homecoming week-end. The condo was spacious and clean, but in need of updating (very 1980s 'country') and serious de-cluttering, and smelled musty when we arrived. The condo development was in a rural area, and very quiet (we did not see another person while we were there), but to advertise that it is within walking distance of Queechee Village is a stretch, in my opinion. We didn't cook, but the kitchen was fully equipped. We enjoyed the area very much; had a nice dinner at the Queechee Club, visited the Simon Pearce Glass Works, toured Sugarbush Farm, and had a very hearty breakfast at Four Aces Cafe. Jake's Market has excellent coffee. Dartmouth is an easy 20 minute drive away. We would probably stay here again.